And patrons sought to fund a comprehensive dating of the La Coruna pohutukawa…. In the beautiful coastal city of La Coruna in Galicia, northern Spain, a large specimen of the New Zealand pohutukawa tree is located. Native to New Zealand, the existence of the tree is an enigma and as part of his research into potential early spanish and portuguese voyages to New Zealand, New Zealander Winston Cowie visited the tree over the weekend, in an attempt to date its age. In doing so, he gifted the tree and people of La Coruna a magnificent greenstone pendant which is now worn by the tree, generously donated and carved by internationally reknowned and Te Hana based New Zealand master artist and carver, Kerry Strongman. Cowie has been working with film director David Sims and last year premiered their feature documentary entitled Mystery at Midge Bay – Discovering New Zealand’s oldest shipwreck. The documentary delves into potential portuguese and spanish discoveries of New Zealand and with one of the shipwrecks of the Pouto Peninsula that they had dated through working with New Zealand dendrochronologist Dr Jonathan Palmer, tentatively concluded that it was of Dutch origin, given the date of the wreck, 1705, and the origin of the wood, South East Asia, where the Dutch were dominant from the 1650s. Cowie and Sims are currently undergoing a consultative process with Te Uri o Hau iwi in respect of the documentary, as the possible Dutch shipwreck is within their rohe, and in time, are looking at negotiating with TVNZ Heartland and Maori television to have the documentary shown on New Zealand television. The La Coruna pohutukawa has been an enigma since first being “discovered” by New Zealander Warwick Harris and La Coruna resident Juan Pineiro in 2001.The tree has not been dated although there is conjecture about its age. 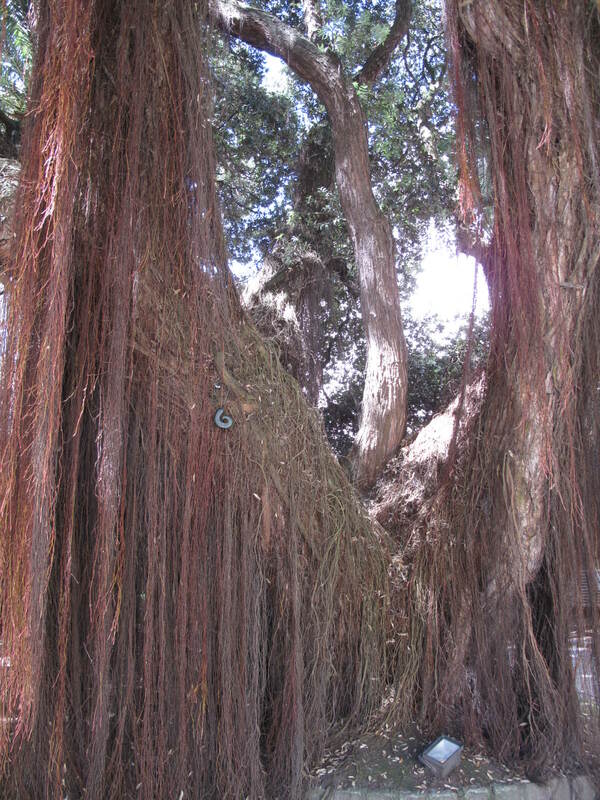 Some say that the tree is 400-500 years old, others say that the tree is 200 years old, brought back by an English sailor returning from the antipodes in the late eighteenth century. It is the second time Cowie has attempted to date the pohutukawa. In 2009, with New Zealand’s top dendrochronologist, Christchurch based Dr Jonathan Palmer, they were due to core the tree and date it, when the Christchurch earthquake struck, affecting Dr Palmer. The trip was cancelled. 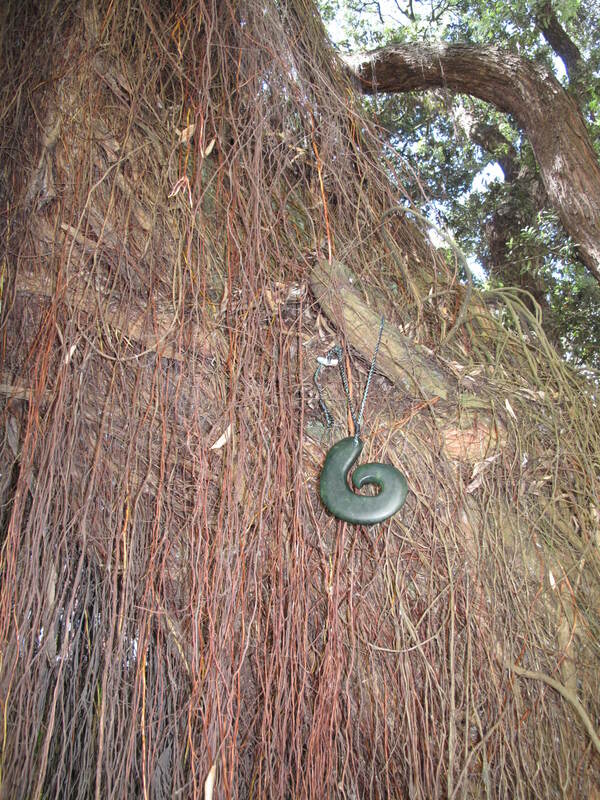 Cowie and Sims, both members of the New Zealand Underwater Heritage Group, have been supported in their research by the Spanish Embassy to New Zealand, and were granted permission over the weekend by the Mayor of La Coruna, Alcalde Negreira Souto, to take one small preliminary sample from the tree. Galician dendrochronologist Dr Ignacio Garcia Gonzalez took the sample from a healthy small branch of the tree to provide some insight into the tree’s growth cycle. 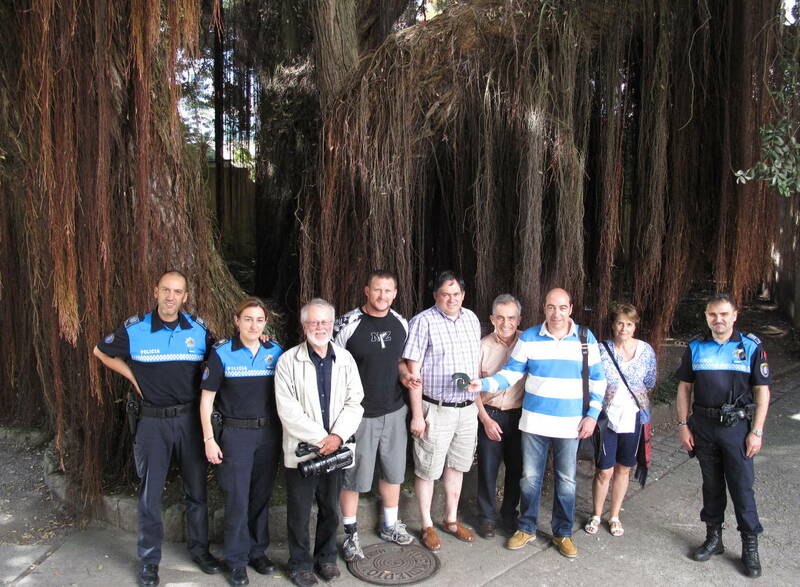 A sample large enough to definitively date the tree was not permitted although the La Coruna Council was happy for a preliminary sample to be taken to raise awareness of the research and give an indication on growth rates. It is hoped in time that Cowie and Sims will return to La Coruna with the world’s leading dendrochronologist on pohutukawa trees, New Zealander Dr Jonathan Palmer, to work with Dr Garcia Gonzalez and date the tree properly, to definitively decipher its age. La Coruna pohutukawa greenstone gifted by Winston Cowie and team. Carved by reknowned New Zealand Master Carver Kerry Strongman. 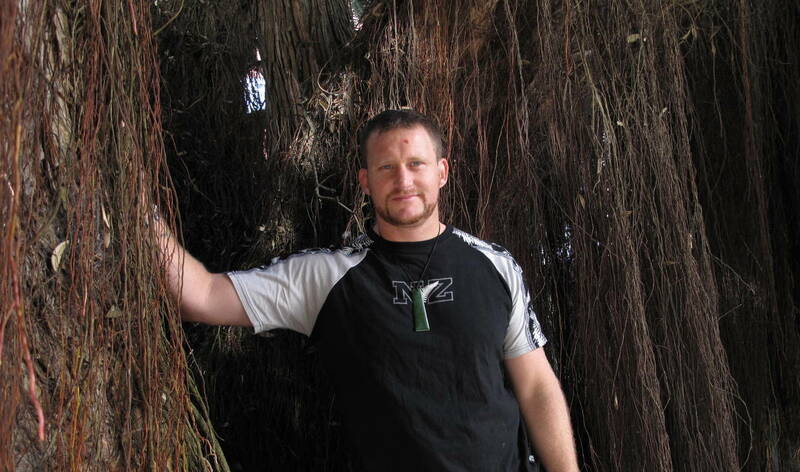 Please check out Master artist and carver Kerry Strongman’s website by clicking here. Cowie is now seeking support, from New Zealand and Spanish patrons, to financially support himself, Sims and Dr Palmer flying to La Coruna, to date the tree, providing all of the permissions are obtained from relevant Spanish authorities. To date, Cowie and Sims have produced Mystery at Midge Bay from their own resources and they say that forking out further funds now would be “over and above the call of duty.” They will be holding two showings of “Mystery” at The Kumara Box in Dargaville in a fortnight’s time. Dates will be released next week. If interested in attending, please contact Warren Suckling at The Kumara Box. And there are only circa 40 out of 500 copies left of A Flame Flickers in the Darkness, New Zealand author Winston Cowie’s New Zealand historical fiction novel or book set during the New Zealand Wars or Maori Wars or New Zealand Land Wars of the 1860s. You can grab a copy from Whitcoulls, independent bookstores and online on PublishMe and Fishpond. Grab one of the last ever copies of A Flame Flickers in the Darkness, today!